Photodegradation of environmental pollutants using perylene adsorbed on silica gel as a visible-light photocatalyst. 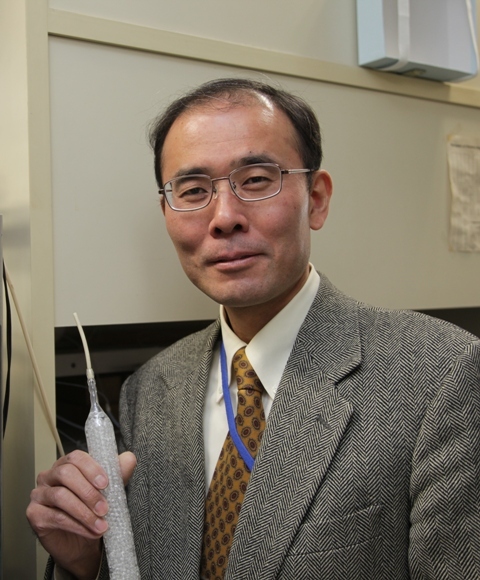 Author:Moriwaki, H.; Akaishi, Y.; Akamine, M.; Usami, H.
Electrochemical extraction of gold from wastes as nanoparticles stabilized by phospholipids. Author:Moriwaki, H.; Yamada, K.; Usami, H.
Photoinduced electron transfer in layer-by-layer thin solid films containing cobalt oxide nanosheets, porphyrin, and methyl viologen. Author:Sasai, R.; Kato, Y.; Soontornchaiyakul, W.; Usami, H.; Masumori, A.; Norimatsu, W.; Fujimura, T.; Takagi, S.
Effects of Rh-doping on the photooxidative degradation activity of titanate nanosheets. Author:Soontornchaiyakul, W.; Fujimura, T.; Usami, H.; Sasai, R.